Each $75 box contains 5 decks. Each deck contains 51 cards. 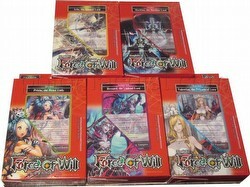 This item consists of one of each of the five Force of Will Alice Cluster TCG Starter Decks: Arla, the Winged Lord (Light Attribute), Machina, the Machine Lord (Flame Attribute), Valentina, the Princess of Love (Water Attribute), Pricia, the Beast Lady (Wind Attribute), and Rezzard, the Undead Lord (Dark Attribute). Cards in these decks are drawn from The Seven Kings of the Lands set and the Twilight Wanderer set. Each deck contains 1 Ruler card, a main deck of 40 cards, a magic stone deck of 10 cards, a quick manual, a manual, and a playsheet.